When British rapper M.I.A. flipped the bird at more than 110 million Super Bowl viewers, it caused the NFL and NBC to flip out, too. But far from hurting her career, it will likely only serve to enhance her badass aura. The lesson: It’s not always a bad thing to cause some controversy. Here’s how to tell when to go for it. When British rapper M.I.A. flipped her middle finger to more than 110 million Super Bowl TV viewers two Sundays ago, it caused the NFL and NBC to flip out too. Rightly so. Both organizations have codes of conduct, regulations, and responsibility to audiences of all ages who were watching the half-time show, which is where this gesture occurred. 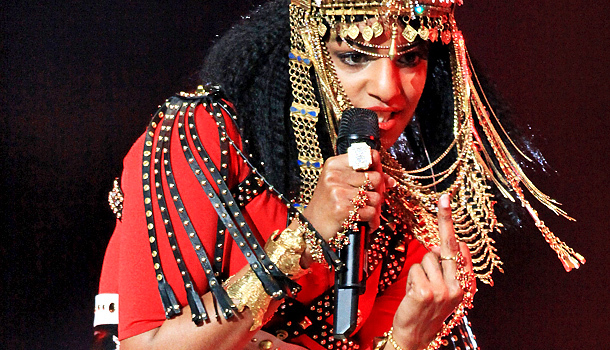 There’s been some finger pointing and talk of how angry Madonna is, but meanwhile, M.I.A. seems to be keeping her head and finger down. Her fans’ reaction to this has spanned a range of feelings from “who cares” to “cheers.” Will this scandal hurt her career? No. In fact, this scandal may enhance her aura and popularity as a badass. It’s just M.I.A. living up to her brand image, like any good brand must do. This case in point goes to show that what’s seen as a “scandal” to some can also be seen as “good publicity” to others. The idea of success through scandal is not a new one. The French even have a term for it: succès de scandale. But of course! A few years ago when Activia yogurt got overzealous in its product performance claims, consumers cried foul. Health claims had to be restated with a bit less creative license. For Activia, this was a scandal and it cost them millions. For a competitor, category scrutiny is a boost to overall consumer knowledge and awareness. Very often in a scandal, one brand’s bad news is another brand’s sales boost. About a year ago, when Taco Bell was called out for its meat-blend filling, the brand addressed the issue head on through public relations. What we learned from this is that a scandal can be audience relative. Perhaps in terms of FDA guidelines, regulations, and labeling there was a scandal. In terms of loyal Taco Bell consumers, they still thought it tasted good, less meat or not. So, what’s so good about being bad? Scandals attract attention. If a brand can overcome the negativity and control the consumer outrage that can quickly pop up online through social networking, the brand, and even category, can benefit from increased awareness. A scandal can level the playing field by bringing issues to light that were not previously in the consumer consciousness. When Nike was called out for using some factories in China that did not have fair labor practices, the company reviewed its guidelines, set high standards to achieve, and caused an entire industry to follow. Corporate responsibility spilled over to category responsibility. Scandals can give brands an edge. If the scandal is just enough to make you seem “bad” but not enough to actually be detrimental your business or consumers, a proactive “sorry” in the right way is often enough to allow the issue to subside and the brand to move forward. The scandal will eventually become part of the brand’s mythology. A scandal prompts course correction and can lead to overall improvements in multiple facets of a brand experience. From tamper-proof caps on medicine to sealed packaging at retail, overall consumer safety has often been improved because of a scandal. Scandal can bring fame. Brands that are known and in the public consciousness are celebrities in their own right. Scandals not only have the power to break a brand, they have the power to make a brand. Just ask Paris Hilton. A brand scandal is often a polarizing incident that has both negatives and positives associated with it. If you are caught in one, it’s always best to face it head on, then devise a strategy in order to move on. The worst thing you can do is go MIA… like M.I.A.